Rabbi Yosie Levine joined the rabbinic team of The Jewish Centerof Manhattan in 2004. He earned a BA in English and Comparative Literature from Columbia University and remains an active alumnus. 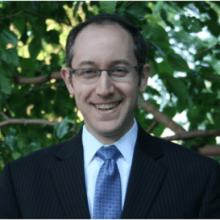 A Wexner Graduate Fellow, Rabbi Levine received rabbinic ordination from the Rabbi Isaac Elchanan Theological Seminary and was the winner of RIETS’ writing prize. He holds an MPA in Public Policy from NYU’s Robert F. Wagner Graduate School and is currently completing his coursework toward a doctoral degree in Early Modern Jewish History at Yeshiva University’s Bernard Revel Graduate School. Rabbi Levine served as Rabbinic Intern, Assistant Rabbi and Associate Rabbi at The Jewish Center where he received practical rabbinic training and mentoring from Rabbi Ari Berman (President-elect of Yeshiva University). Before joining the Center, he served as the educational director of the Lauder Foundation’s Beit Midrash in Berlin, Germany and as the visiting scholar of Congregation Knesseth Israel in Birmingham, Alabama. Rabbi Levine has taken a leadership role on the issue of day school affordability and serves as the chair of Manhattan Day School’s Political Advocacy Committee. He is co-chair of the Manhattan Eruv and is active in numerous communal organizations including AIPAC and the Beth Din of America and serves on the Board of UJA-Federation of New York. Rabbi Levine’s wife, Rachel, is a clinical psychologist in private practice in Manhattan. They are the proud parents of Akiva, Yehoshua, Ari and Judy.